You can visit The Hangar and leave in style this Saturday during Bomber Shop HQ's unique sale. Essendon fans will have a unique opportunity to visit The Hangar and get their hands on a range of merchandise this Saturday with Bomber Shop HQ’s end of season sale. 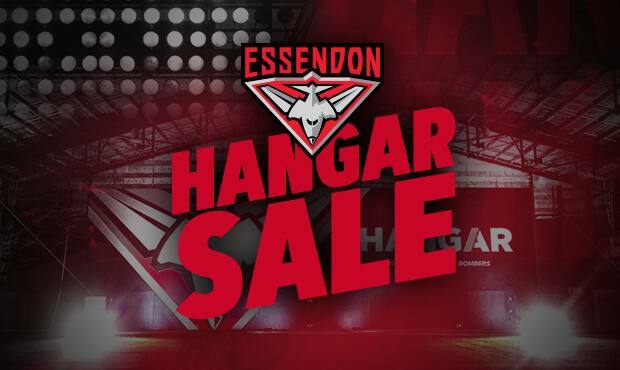 The sale will be held within The Hangar, providing fans with the chance to see where their favourite Bombers prepare every day while taking advantage of some outrageously low prices. The sale will see up to 70% slashed off ISC apparel prices between 10am and 3pm with stocks limited. There are also games and giveaways set to start at 11am, ensuring there will be plenty of entertainment for all. So, if you’re on your way to watch the VFL Bombers take on Casey Demons in Saturday’s preliminary final, make sure to drop into the club on the way to get your hands on some fresh Bombers gear to cheer on our boys in style. But don’t fret if you can’t make it, because you can still take advantage of the current sale of up to 50% online at bombershop.com.au.